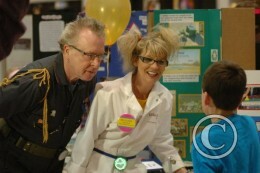 The public is invited to see the student displays at the 2012 Invention Convention in the Student Union Apollo Room beginning at 2 p.m. The awards ceremony will be at 4 p.m. Global warming. Water shortages. Affordable technology. Inventors strive every day to identify problems like these and to solve them elegantly. On Saturday, March 17, local inventors in grades K–8 will showcase their creations at the Invention Convention at Wright State University. The Invention Convention program is run by the 501(c)3 nonprofit organization Just Think, Inc. Executive director of the Invention Convention Cherylyn Rushton said that the goal of the Invention Convention is to foster critical thinking in participants. Students from school districts across the Miami Valley will participate in the event. Private and home-schooled students will also participate. The public is invited to see the student displays in the Student Union Apollo Room beginning at 2 p.m. The awards ceremony will be at 4 p.m.